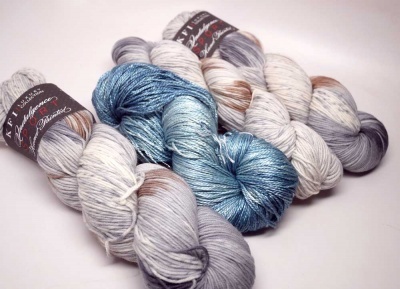 You know how you can fall in love with the colors of a variegated yarn and then spend months trying to find the perfect pattern to showcase it beautifully? 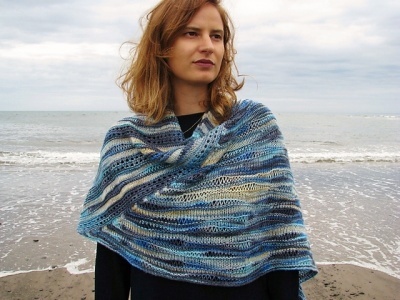 Well, Ilga Leja has created a design in Sea Storm that uses not one but two variegated yarns to a marvelous effect. 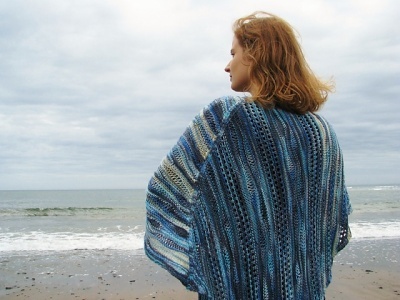 Make sure to get the pattern from Ilga's Ravelry page directly. What we offer here is yarn sets that will look awesome plus beads if you so choose. Let the waves roll in. 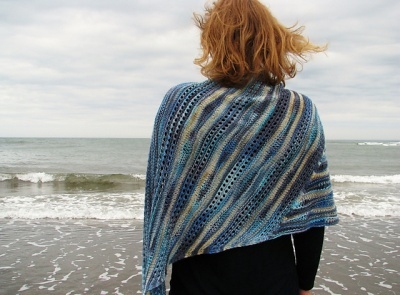 Make the last days of summer extend into the fall with a generous shawl that can also be seamed to form a poncho. 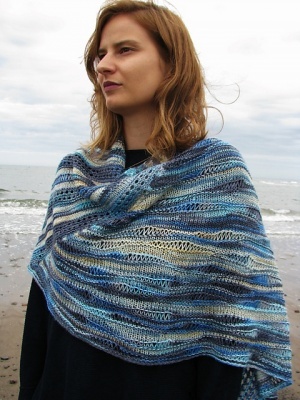 We have put together kits that do not use the same yarn as Ilga used in her original. You can see our choices in the inset photos on the top picture and again below that. What is needed is Color 1: 711 yards (650 m) and Color 2 with at least 219 yds (200m). This will make a finished size of 21.1" deep (53 cm) x 62" (155cm). Ilga recommends either sport weight or double knitting yarn. Our kits include three skeins of the listed Colors A and one of Color B. Kit A: Sorry, sold out. Color A: From KFI Luxury Collection, Indulgence is a handpainted sport weight yarn of 100% superwash wool and 341 yards (312m) per 100g. 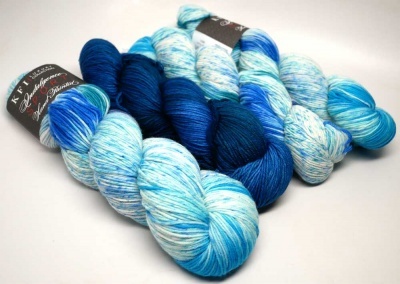 The colorway is called Ibiza Royale and is a wondrous blend of calm-sea-colors including pale foam, aqua, teal, blue and turquoise with speckles of blue and teal. Color B: From Malabrigo, their Arroyo sport weight yarn with 335 yards (305m) per 100g skein of pure superwash merino. 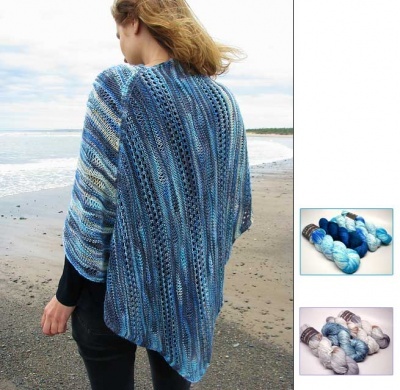 The colorway is called simply Greenish Blue and is a tonal blend of blues and teals. Color A: Again Indulgence Hand Painted, this time in Iridescent Memoir, a wonderfully sophisticated variegated blend of neutrals including cream and pale gray, brown and charcoal, with speckles and dashes as well. Color B: From the KFI Luxury Collection again, this is Luxury Silk, a 100% silk yarn with 289 yards (265m) per 100g. It feels awesome. The color is #65 and is a tonal almost-solid blend of varying depths of blues, a wild and stormy sea. 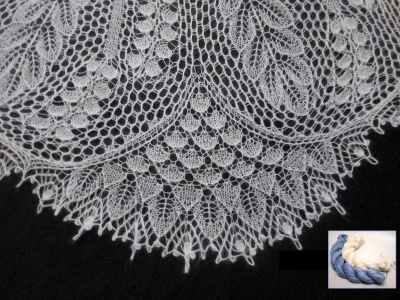 No, Ilga does not specify any beads with this lovely design but I thought it could look very fine to add some beads to the long yarn-overs perhaps. If you would like some 6/0 beads to work with your kit, select that option from the drop-down menu. We'll include a 25g containers --that will give you about 300 beads.